Buccigross: We're entering the depths of blogging again! We haven't blogged an NHL game in some time. So let's do one. Anaheim vs. Ottawa. A rematch of last season's Stanley Cup finals. It has been an eventful time for both teams since they met in June 2007. You know how it works. We present an NHL photo, and Bucci provides a caption. E-mail him your suggestions (include your name and hometown/state), and we will use the best ones and provide a new photo the following week. "Snow cones, here! Get your snow cones!" Everyone ran to the bathroom? What do you expect on "All-you-can-eat-chili-and-sauerkraut Night"? "This is On-star, how may I help you?" "Yes, I'd like to report that the ice is clean and ready for action." "You might have gotten Hossa, Pittsburgh, but at least our Zambonis work." 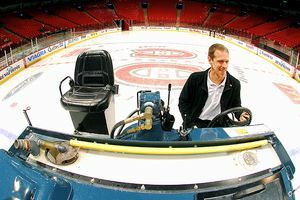 Police drummer Stewart Copeland moonlighting as the Zamboni driver at the Bell Centre. Anaheim has had two players contemplate retirement, and then, reminiscent of ol' boxing days gone by, return for possible future glory and hundreds of thousands of dollars in biweekly paychecks. Anaheim GM Brian Burke has been rumored to be heading to Toronto to take over that mess at the end of the season. Anaheim has Edmonton's lottery pick in this summer's draft. Ottawa fired the coach it promoted last summer, John Paddock. Ottawa's goalie, Ray Emery, appears to be more in love with the benefits of being a professional hockey player than the actual craft of being a professional hockey player. It's the music equivalent of Britney Spears and Allison Krauss. Ray would be Spears; Jean-Sebastien Giguere would be Krauss. One is less famous, but more committed. Ottawa has had injuries. They had some contracts to take care of; there's one left in Wade Redden that the Senators would have probably moved if he had waived his no-trade clause. That can weigh a team down; so can the lack of secondary scoring. With all this in mind, let's drop the puck in Anaheim. 20:00 -- The game is on. Ottawa starts its big line of Jason Spezza, Dany Heatley and Daniel Alfredsson. Anaheim counters with Samuel Paulson, Rob Niedermayer and Travis Moen to check them. This is why Anaheim is still a Stanley Cup favorite. It can throw together these sturdy, mean, nasty lines to counter soft skill. 19:50 -- The game is seconds old and linesman Brad Lazarowich (No. 86) gets hit in the foot with a puck. The players mull around to see if Brad is OK. Later in the game, they will swear at him like a drunken sailor when he calls a close play offside. Brad is 45 and from Vancouver. He broke into the NHL in 1986, when he lined a game in Winnipeg. I'm sure that's why he wears No. 86. Now, when you go to your next game and see a linesman wearing No. 86, you can impress your date with that info. Women GO CRAZY for that stuff. As the players mull around to feign concern for Brad's pain and misery, I can't help but notice how much I love the number style employed by the Senators. Brad looks to really be in pain. I assume the concern is whether he has a broken bone. For now, he lines on. 18:43 -- Chris Kunitz breaks in alone and is denied by Martin Gerber. (Emery called in and said he was running late from his facial and pedicure. I'm pretty confident if you went to Emery and asked him, "A day at the spa or play the Ducks tonight?" he's goin' spa every time.) Gerber looks to have the confidence of a 14-year-old freshman going in for his first shower with the varsity team. Yes, at times, Gerber looks like a moose being born as he flops on the ice to cover the puck. Oh, the confidence he oozes. 18:17 -- Ducks play-by-play man John Ahlers just used a term I never heard before: "Sweater switch night." (Hey now!) The Ducks are wearing white and the Sens are in red. I know we've gone back and forth on this uniform color scheme throughout NHL history, but I believe most of us agree, after looking at the evidence and contemplating it, home NHL teams should wear white. It just feels right. I like this broadcast already. 17:59 -- Todd Bertuzzi is out there with Ryan Getzlaf and Corey Perry. Ottawa counters with Dean McAmmond, Shean Donovan and Christoph Schubert. If Sens GM/coach Bryan Murray thinks that is a good matchup, he should fire himself right now. One word: mismatch. Get them off the ice now! 17:30 -- The FSN crew puts up some stats during the broadcast. The Ducks are 5-1-0 on their current homestand. They are 12-2-0 in their rink named after a car (can you feel the nostalgia?!) since Dec. 19. They also have 46 points at home, the most in the NHL. The Ducks are coming on strong, people. 17:00 -- Anaheim is booing Alfredsson whenever he touches the puck. During Game 4 of last season's Cup finals, Alfredsson shot the puck, rather obviously, at Scott Niedermayer as the second period ended. The broadcast flashes back to the highlight. It's another example of how hockey can make a very sane, reasonable man like Alfredsson temporarily turn into a mad man. If you've played the game, you've felt that rage when things are not going well. We all have. 16:00 -- Doug Weight is centering Teemu Selanne and Kunitz. How Weight plays the rest of the way will go along way in the Ducks' chances at repeating. Last season, Andy McDonald did a great job chasing down pucks with his speed. Weight won't win those battles, so Selanne and Kunitz may have to do more puck-retrieving work playing with Weight. But once Weight gets the puck, he can make magic. Anaheim is completely controlling this game so far. Selanne looks exactly the same as last season. He hasn't lost a thing. 8:02 -- Goal Bertuzzi. 1-0 Anaheim. Beautiful read by Sean O'Donnell to take the D-to-D pass closer to his partner and move the puck up to Perry on the blue-line boards. Perry feeds Getzlaf, and when Getzlaf sees Gerber aggressively challenge him, he makes a beautiful feed to Bertuzzi on the off wing and Bertuzzi finishes. 5:00 -- 2-0 Anaheim. Power-play goal. Scott Niedermayer takes a pass from Weight, walks the line, wrists it toward the net and the puck appears to hit Senators defenseman Mike Commodore in the leg. They give the goal to Perry, his first in 10 games. 4:30 -- Andrej Meszaros injures his leg and Schubert, a defenseman who was playing forward, replaces Meszaros and promptly scores to make it 2-1. After the game, Schubert will go back to his hotel and write a symphony because, well, his name is Christoph Schubert and he just has to compose with a name like that. Heatley and Alfredsson get the assists. End of the first period -- 2-1 Anaheim. I don't see any way Ottawa wins this game or how it could ever beat Anaheim in a seven-game series unless the Ducks are hit with malaria. 18:40 -- Bertuzzi is really looking good with Getzlaf. He is moving well and his hands and feet are fast. This could be the most dangerous line once the postseason begins. Bertuzzi looks healthy and Southern California probably is a good place for him to play. The cauldron of Canada might be too much for his personality. 16:30 -- Another good graphic from FSN. 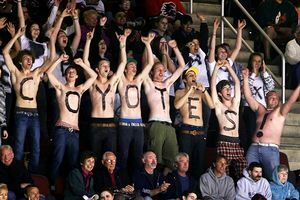 Since 1997, no team has returned to the conference finals after reaching and losing in the Cup finals. The Capitals (1998), Hurricanes (2002), Ducks (2003) and Oilers (2006) all missed the playoffs the season after reaching the Cup finals. The Stars made it to the second round of the postseason after reaching the 2000 finals. In the most difficult tasks and challenges, hunger is the most important ingredient, then confidence. Ottawa looks like a team that is lacking both. The Sens' talent will carry them through the regular season; but if they don't get hungry and confident soon, they won't last long. 14:28 -- This Ottawa team needs Chris Neil's presence badly. It looks like Ottawa is playing an intrasquad game without Neil's passion and intensity. They are an easy opponent so far. The cast of "Full House" would give Anaheim a better game. 8:10 -- Speaking of television shows from the '90s, Matthew Perry is in the house for the game! Matthew was born in Massachusetts, but raised in Ottawa by his mom, thus his affection for the Sens (although these Sens were not born until Matty Ballgame was 23). Matthew's mother, Suzanne Morrison, was the press agent for Pierre Trudeau, the Prime Minister of Canada, during the '70s and '80s. Perry has dual citizenship in Canada and the United States. He spoke the last line in the final episode of "Friends" in 2004. When it's suggested the group go out for coffee, his character, Chandler, says "Where?" There were 236 episodes of "Friends" between 1994 and 2004. OK, back to the game. Damn you, Matthew Perry! No relation to Corey Perry or Mathieu Schneider. End of second period -- While all that was going on, not much was going on during the second period. 2-1 Anaheim after 40 minutes. Ottawa had five scoring chances and one chance off the rush. One more Ducks goal early in the third should seal it. The third period begins with Chris Pronger making a visit to the broadcast booth. Pronger is recovering from a broken jaw. Pronger said he skated and felt good and he should be back soon. 19:30 -- For the second straight period, the Ducks get a great chance in the first minute. The Sens have come out sleeping again. • Burke's wife, Jennifer Mather, works in Vancouver as a television personality and Burke has often said he will retire in Vancouver. L.A. to Vancouver: 1,072 miles as the crow flies and it's the same time zone. Toronto to Vancouver: 2,091 miles, almost twice as far for the commuter. Of course, Mather could move up marketwise and get a job in Toronto. • Burke should be named GM for Team USA's entry for the 2010 Olympics in Vancouver. He would love it. But could that really work? The Olympics are an emotional time. How does Burke balance being the enemy of Canada while trying to reconstruct the Leafs? That seems daunting to me. It might come down to what job he wants more. Leafs GM or Olympic GM. He could do both, but I don't think that's feasible. • The Ducks could be good for some time. Now, if Selanne and Scott Niedermayer retire, the Ducks will lose a step, but will still be good. They gain cap room, and don't forget that lottery pick this June. Toronto has major challenges as it continues to age. But Burke probably knows the Ducks might be at their peak right now. This would be a good time to get out, and it certainly gives him the most leverage in contract talks. • Anybody would love to have the Leafs GM job right now. They are at the lowest low despite their recent play and it would be fun to go in there, clean house, debate with the local media, make big moves and fix things. You know the prospect of that gets Burke's blood flowing. It gets mine flowing. My heart says he will take the Leafs job; my head says he will not. 10:54 -- Oh, by the way, the game is still 2-1. This game is begging for something to happen. Weight just made a great pass to Selanne. I think this combination will work. The Sens are called for a high-sticking penalty and a bench minor. This should be the nail the Ducks are looking for. Niedermayer, Schneider, Getzlaf, Selanne and Kunitz on the power play. 10:01 -- Great play by Schneider to set up Niedermayer, who scores just in front of the left faceoff dot. 3-1 and Anaheim is still on the power play. 8:02 -- Bertuzzi needs to shoot more. When Getzlaf makes a nice play and feeds you, shoot. Shoot! Shoot! A lawnmower would score 13 goals playing with Getzlaf. 6:53 --Wow! Murray was just run! Thrown out of the game, baseball style! When do you see that?! No bench penalty, just gone. No thrown bench like Robbie Ftorek or anything. Murray must have used some "American Pie" DVD extra language because he didn't even argue the ejection. His team's soft effort and lack of a physical response must be sickening him. Let's see how they respond. There have been no fights in this game and Anaheim will fight anyone, anytime. Marc-Andre Bergeron just challenged Matthew Perry. 15:40 -- Another double-minor on the Sens. Slashing and unsportsmanlike conduct on Randy Robitaille. And that will do it. Final score: Anaheim 3, Ottawa 1. This was a great game to blog and dissect because it was a stark example of two teams going in opposite directions. Ottawa: A mess. Spezza was the only noticeable player in the lineup. He was named the game's third star. Without Neil, they have no jam. Their team is falling apart at the seams. They are 3-7-0 in their last 10 games and are falling in the East. But in this league now defined by parity, we have seen teams regroup many times over this season. It will take leadership and resolve, and the Sens have that in them. But right now, they are teetering. Anaheim: The Ducks are perfectly peaking. They have all the ingredients to be the favorite in every best-of-seven series they play in. No one has better résumés from the net out than Anaheim. Don't count them out in their pursuit of Dallas for first place in the Pacific Division and the Stanley Cup. They have to be considered a strong favorite to repeat. It is great to have Ken the Otter back. I was afraid he had been ... well ... we won't go there. Ken is back and better than ever. He's back in the gym, taking his supplements, doing squats, preacher curls, leg presses, the whole thing. And man, those female otters at the gym didn't dress like that 10 years ago. It's like a Motley Crue video. For those of you who collect hockey cards and other collectibles, prepare for Ken (in one form or another) and I to make our trading-card debut soon. Together, forever, on the same rookie card. It will be the finest hockey card since Bruce Shoebottom's rookie card. Amazingly, this is not a joke. In case you missed it, during Brad Richards' debut in Dallas, when the Stars scored their sixth goal (Niklas Hagman's hat trick goal), the PA system in the arena blared the sound of Al Czervik's car horn from "Caddyshack" -- "We're in the Money!" I can't even tell you how thrilled I was to hear that. "Oh, Dolly, I'm hot today." "That must be the tea." "Are you gonna eat your fat?" I just saw a preview for Michael Myers new movie, and immediately thought of you. Were you hired as a consultant, merging your love of all things Michael Myers with your love of hockey? I just watched "Austin Powers in Goldmember" the other day. SOOO underrated. The three Austin Powers movies came out in 1997, 1999 and 2002. We are due for another one and Mike Myers has hinted a fourth is coming. Probably in 2009 or 2010. "Pitka, an American raised outside of his country by gurus, returns to the States in order to break into the self-help business. His first challenge: To settle the romantic troubles and subsequent professional skid of a star hockey player whose wife left him for a rival athlete." Myers plays Pitka. Jessica Alba and Justin Timberlake also star in the movie. Verne "Mini Me" Troyer plays a Russian coach. And I can tell you Barry Melrose read some lines for the movie from the "SportsCenter" studio. If it doesn't get cut, Barry will be on the big screen again. I was attending a Wild game the other night when we were treated with a Shjon Podein sighting. He made the honorary "Lets Play Hockey!" call that is customary before every Wild game and that made me wonder if Bucci's next book is going to be called "Podes: A True Character of the Game." I think the only problem with putting all the stories of Podes in a book is it would make it about a 1,000-page read. He is truly one of the game's good guys. I would love to do a book with Podes and have actually mentioned it to Shjon in the past. I thought a book on Keith Jones would be enjoyable to do, and hopefully enjoyable to read, because Jonesy has so much heart and character. Podes is the same way. And like Jonesy, he has loads of hilarious stories. A lot of you regular readers still haven't purchased "Jonesy: Put Your Head Down and Skate." It hurts, man. It hurts bad. Right here (I'm pointing to my sternum). I love high-skill skating teams that can rush the puck across the blue line. Conversely, I don't like dump and chase. So, which five players would you pick to rush the puck across and which five players would you take to dump and chase? Wow, cool question Will. And yes, folks, there is a Rancho Santa Margarita, Calif. It is in Orange County and it means "Small farm where Santa gets hammered on Dec. 26." Please, please, please use whatever pull you have (or get Melrose on the soapbox) to get the NHL to extend overtime to 10 minutes. The five minutes is just not enough; 4-on-4 is wide open and shootouts would be rarer. I just finished watching the Flyers-Sens game and the game was good, but the overtime was some of the most exciting hockey I have seen all year! I've been pushing for five more minutes of 4-on-4 hockey in this space for four years. It would hardly take more real time and fewer games would get to shootouts, preserving its uniqueness. I have also been pushing for you to buy the first two CDs from Editors. And for insane, playoff-hockey metal, buy the debut CD from Five Finger Death Punch. Do you think Montreal has what it takes to win it all for their 100th anniversary next season? Every expert ranked them at the bottom of the Eastern Conference last season. But man, our young players are amazing! Both Kostitsyns, Carey Price, Chris Higgins and Tomas Plekanec. Alexei Kovalev should be considered for MVP and our defense is one of the most underappreciated in the league with Mike Komisarek, Andrei Markov and Roman Hamrlik. I think we are not that far away from the Cup. What do you think? La Coupe Stanley aux Canadiens! There is plenty to like with the Montreal Canadiens. 1. They score goals: 209, most in the East. 2. They have the best power play in the East. 3. They have the most road wins in the East. 4. They have balanced scoring and good blue-line play. 5. They MUST lead the league in blue-eyed, brunette girlfriends. I was surprised GM Bob Gainey sent Cristobal Huet to Washington for a second-round pick at the trade deadline. I know Montreal was not going to re-sign Huet this summer (when he becomes an attractive free agent for teams), but to get just a second-round pick seems like a strange move. The Habs lose a good insurance policy in net and trade Huet to a team that might play Montreal in the first round of the playoffs! Trade him to the West, even if it's for a third-rounder. Like I wrote last week, I'm OK trading Huet if you believe it is best for Carey Price and the coaches if you remove all doubt on who is the No. 1 goalie. But trading Huet to the Caps seems dangerous. But back to the Habs as a whole. I love their team. They play and have the same energetic buzz the Sabres had in their previous two seasons. We have to see if the Habs are built for the playoff grind. It's not so much the level of play in the postseason; I think that is a big difference in the NHL's past and present. The difference in the regular season and postseason is not as drastic as it once was. There is more regular-season intensity night in and night out than there used to be. The league is younger and fitter, and a large percentage of the games are very competitive because of parity and a deeper player pool. Some guys can't play very well, but they can skate. Old-school hockey had players who were bad AND slow. The intensity does go up a few notches in the postseason, but if the Canadiens just play their game, they could be a threat with their skill and balance. We'll just have to see how some of the young players react. I'm writing to you as a grandmother who knows nothing about hockey except that my 9-year-old grandson, Iain, a goalie, is heartbroken today because his coach did not play him in Saturday's playoff game or today's championship game. He's the kid who loves the sport, adores Martin Brodeur and became a goalie because the team needed a second one. He never missed a practice, sometimes at 6:00 a.m. when the rink was available. 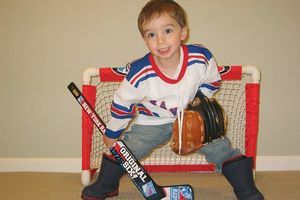 He went to Brodeur's hockey camp last summer. He has had many, many shutouts to his credit during his two years on a team. Am I just a silly, naive grandma? Is it all really just "winning the game at all costs" even when the players are 9- and l0-year-olds, love hockey, have learned to accept defeat as well as victory and want to be valued as a participant in the game no matter how briefly? He said he would have been happy just to be played for a few minutes. Obviously it is difficult to assess a situation like this from afar without knowing the characters involved and the objectivity of Grandma. But, on the surface, it stinks on ice. 1. Hockey is a pay-for-play sport. You pay, you play. On that basis alone, everyone plays. Thomas Jefferson could have gotten behind that. 2. The primary reason for your son or daughter to play hockey is for exercise. Everything else is second, including winning, teamwork and getting the coach's son a hat trick. 3. There is absolutely no correlation between preadolescent athletic achievement and postadolescent athletic achievement. Save your money. Take your kid to public skating, buy him or her rollerblades in the summer, play weekend spring hockey, go to a fun camp for a week in the summer, watch games together on TV and use the TV to explain a textbook play Mike Cammalleri made scoring a goal in Minnesota on Sunday night. But simmer down on the preadolescent intensity when it comes to sports, whether it be winning or expensive travel teams or clinics. One reason kids love playing video games is because there is no adult presence. They don't get criticized. ("How did you let your brother blow your head off like that!" "You are holding that controller all wrong!" "Focus!" "Why don't you play Halo 3 like Billy does!") Therefore, a focus on winning at such a young age is destructive. The younger one is, the more one associates victory, defeat and playing time with self worth. Now, there are kids who are undeniably more competitive than others, who "care" more than others. These are kids who have an athletic knack and awareness and are more "advanced" when it comes to hockey. I have no problem with perhaps giving these kids a little more ice time. This can be done tactfully, strategically and intelligently without anyone on the team knowing it. I am completely against pulling a 7- or 8-year-old kid off a line he has skated with the entire game and putting a "better" player on that line late in a game or in power-play situations. This is bad for the self-esteem of the kid who skates off the ice embarrassed and it is hypocritical of the coach who preaches "teamwork." The purpose of youth sports is to teach the value of exercise as it pertains to health and its byproduct of an energetic existence. It is to teach the value of improvement. We improve when we are nurtured, loved, respected and "pushed" by enthusiasm, energy and affection. There is no upside to demeaning, embarrassing or yelling at a preadolescent athlete in terms of winning and losing. Have organization and order, yes. But they should all play. I have been following the Richard Zednik story. What I was wondering is, why don't these guys wear a neck guard? There is one required for use in short-track speedskating for just that reason. They aren't very cumbersome and don't restrict movement at all (my kids wear them for speedskating events). This would seem to be a simple fix, or does someone have to lose their life before they wear them? For that matter, I think visors should be mandatory. The shortened careers of Al MacInnis, Bryan Berard, etc., isn't enough incentive? Some of you e-mailed me, wondering why I didn't address the Zednik injury after it happened. Generally, I don't like to write the obvious stories so soon. One exception that comes to mind is writing a column after Dan Snyder's tragic death. I was at the ice rink in high school when my friend was refereeing a kids' game. After the play, he bent down to pick up the puck, and at the same time, one of the players fell. The kid's skate sliced my friend across the neck leaving a 6-inch scar parallel to his jaw, centered at his trachea. The only reason he survived is because one of the parents watching the game was a doctor. The sad irony? He was one of the few kids that actually wore neck guards during our games. Neck guards should be mandatory at the lower levels, but in the NHL? Too many players would find them constricting or useless. Neck guards don't cover the entire neck and only serve to deflect the damage to another area. It's unfortunate when it happens, but often times there's little one can do. It's a freak accident. Should we enforce full cages? That doesn't sound realistic, and how many times do players gets sticks up in the eye area? A lot more often than skates to the neck. I came across the reader e-mail about Zednik, and to be honest, his injury rang a little close to home. The exact same thing happened to me in a tournament in Montreal nine years ago when I was 17. I was lucky because, although the cut was bad, it missed my jugular by a centimeter and windpipe by a millimeter (the doctor that stitched me up in the ER asked my dad if he wanted to see my Adams apple) and only left me with a nice scar. It was hard to see it happen to Zednik, and the first time I saw it, I wanted to throw up (which made me happy there is no YouTube video of my injury, and I have not been able to watch the replay again) because it was exactly the same scenario in my case (standing up, player got up-ended and sliced the center-to-left side of my neck). But in response to neck guards being mandatory, the doctors I saw -- my own back in Rhode Island and the doctor in the ER in Montreal -- both said with the angle the skate went in, if I had been wearing a neck guard, the skate almost certainly would have glanced the neck guard and been deflected up into my jugular with that being the center of impact instead of my windpipe, which would have left me in a more dire situation. Luckily, it was a tournament that was fully staffed with EMTs. So, to weigh in on the situation, it would be hard to make players wear a neck guard, especially because every scenario is different. Would it help? Sometimes. But it could also hurt like if the skate got tangled in there and a guy kept trying to pull his skate away. I wore a turtleneck for about a week after I returned, and then couldn't stand the restrictive feeling. It is a dangerous game, and these situations are unfortunate, but we all know when we lace them up. And as hard as it is to see these things happen, the incidents are rare. We want everyone to be safe, but some things come with the territory of playing a fast-paced game with sharpened blades attached to your feet. Miles is not even 3 years old and he's keeping it old school without the mask. And you may be right about the wider nets -- he's giving you nothing to shoot at.